Welcome to 5 Scaup Court in Sea Pines! If you are needing a peaceful break from the stresses of daily life, 5 Scaup Court is your destination. 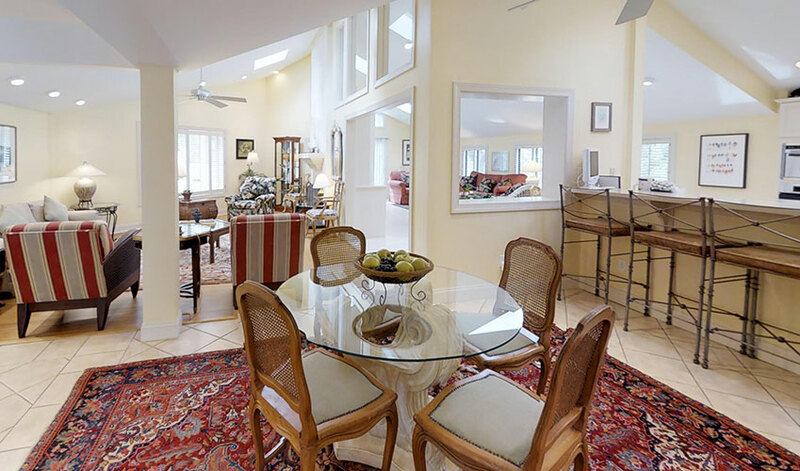 Located in the heart of South Beach in Sea Pines Resort, 5 Scaup Court offers 3 bedrooms, each with private baths, 2 living areas and a private swimming pool for a supremely relaxing vacation. The floorplan is open with wonderful bedroom separation, living room and separate "Carolina Room" with half bath. Whether you are enjoying TV, board games, reading or catching up with friends and family, you will never feel cramped at 5 Scaup Court as there is plenty of room to enjoy a multitude of activities all at the same time. 5 Scaup Court offers fine furnishing and beautiful accents. Enjoy the open kitchen with counter TV, granite countertops and tile floor. The bedrooms include two King bedrooms and a third bedroom with 2 Twin beds. Private baths and TVs are located in each bedroom, and additional features include wireless high-speed internet access, skylights, ceiling fans, plantation shutters and a covered carport for parking cars or bikes. Free tennis is included at South Beach Racquet Club, and one of the focal points of this spectacular beach home is the private swimming pool (can be heated for an additional charge) in a beautifully landscaped courtyard. The wonderful location allows you to walk to activities at the South Beach Marina Village such as dolphin tours, guided kayak trips, dining, tennis and shopping, as well as walking distance to the miles of sugar-sand beaches. The proximity inside the gates of Sea Pines also gives you access to endless bike paths, three championship golf courses, two world-class tennis centers, the Sea Pines Beach Club and a 650-acre forest preserve, just to name a few. Lawton Stables in Sea Pines is also an attraction you won’t want to miss! The petting zoo is 2nd to none and guided horse tours are offered daily. Most Sea Pines amenities are open to the public, but some may have parking fees or seasonal rates as determined by the resort. As always a beautiful house and knowing you were a phone call away to help with any problems or questions made our vacation a true vacation. From the towels to all the start up products for our first few nights are great. We love the proximity of our vacation house to the ocean, bike paths, and South Beach. Thank you again and again! I was very happy with the entire experience. Booking the room was easy. Getting the package mailed to us ahead of time was helpful, particularly with the parking pass. The house we stayed in was as nice as advertised - spacious and clean. I'm looking forward to booking another trip with you! Another fabulous vacation on Hilton Head Island! The house is just perfect for our family and the location couldn't be better. This was our second year renting this house and we absolutely love it! The home we rented was wonderful - spacious, beautifully decorated, very well equipped, comfortable, and great location which was a short walk to Tower Beach and to South Beach shops and dining. We have been vacationing on HHI since the 1970s and have frequently rented through Destination Vacation because of their reputation, great quality housing, and helpful responses. I certainly recommend DV! Excellent rental with regards to location of beach, proximity to south beach marina,home floor plan,beautiful pool and courtyard,very quiet and private surroundings and the management by destination vacation was impressive from start to finish. Would definitely return to this lovely Hilton head home. 5 Scaup Ct is a perfect location. One block from beautiful Tower Beach and 2 blocks from the Salty Dog and South Beach Marina. Very quiet cul de sac. A 3 bedroom 3 bath home with plenty of common space. Updated kitchen, bath and electronics. A small private pool and gas grill for outdoor enjoyment. I would highly recommend this house and the Sea Pines neighborhood. We have now stayed in the same location 4 times because it is a perfect house for our family. We were very pleased and fortunate to be able to share the house with our daughter and son-in-law. We thoroughly enjoyed the Lands End, the bike trails and the Rice Dike in the Forest Preserve. A bike ride to Lawton stables brought back childhood memories for my daughter as she enjoyed the horses that came to the fence for attention. My wife just likes being there. I could go on and on as Hilton Head, especially Sea Pines, provides the most relaxing and satisfying family vacation experience possible. God willing, we'll see you next year. This is our 2nd time to Hilton Head Island but 1st time renting a house. We love South Beach area, great home, pool and lovely beach area, quieter atmosphere!! It is awesome. This is the perfect place with a spacious "big" tub that our 2 year old claimed as his own! This was out second time here and the first time coming with my boyfriend! We spent a lot of time at the beach and the Salty Dog. Tiff and I did some shopping at Harbour Town and may or may not have eaten ice cream twice in one day. It was fun and we can't wait to come back to the beach! Thank you for sharing your home with us! Thank you for sharing your beautiful home - we felt right at home and enjoyed our visit. This was a vacation of a lifetime for us. Thank you! What another great 3 weeks in March! Your home is so comfortable and the kitchen is fabulous. We loved the new couches and the new bathroom. Thank you for allowing us to share your beautiful home. We look forward to being here next year. Thank you so very much for sharing your lovely home with us. We spent a wonderful week with our parents, wandering the beaches and forested neighborhoods. It has been a childhood wish of mine to visit Hilton Head, and our trip here lived up to a lifetime of expectations. This is thanks in no small part to the convenience, comfort and style of your lovely home. We look forward to a return visit. Another great week at 5 Scaup Court! We had a wonderful time with grandparents, parents and kiddos. We loved your house with its elegance and convenience to the beach and South Beach Marina. We have been renting many places at Hilton Head and your house is by far the best. We brought two generations of family with us so we needed the space. I hope we can return to your house again. We love your home. Thank you so much for sharing. We loved the beach access and pool! Everyday we rode our bikes to the Salty Dog and beyond! We want to return next year! P.S. My husband loved your TV and I enjoyed watching the French Open.